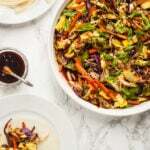 Stir-fried vegetables and scrambled egg are served up on Mandarin pancakes and topped with a sweet and salty hoisin sauce in this quick and easy take out at home meal. 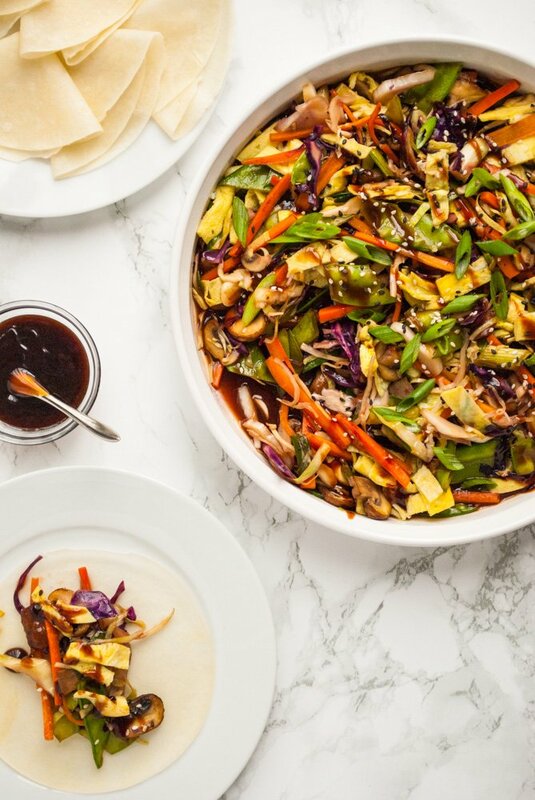 Moo shu vegetables are one of my favourite go-to weeknight dinners. It can be on the table in under 30 minutes, it’s versatile and can be made with pretty much any vegetable kicking around in your fridge, and it’s full of flavour. 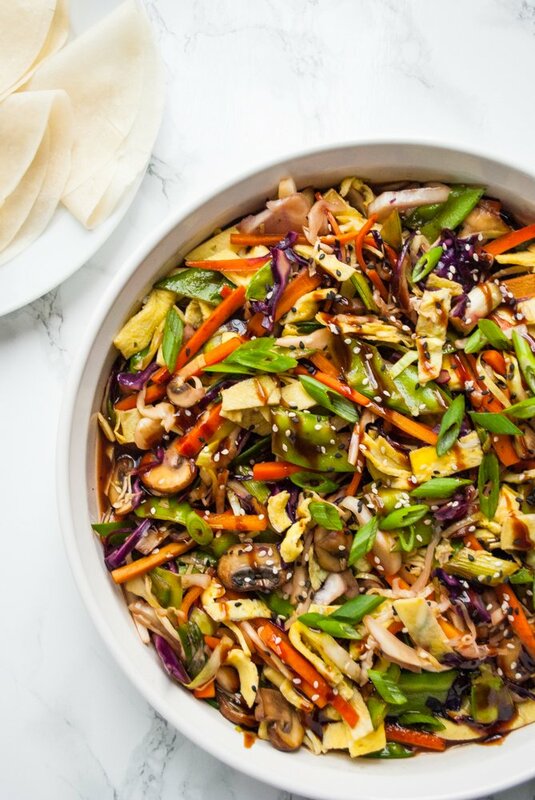 I love the combination of cabbage, carrots, mushrooms and onions in this recipe, but I also make moo shu vegetables as a ‘fridge clean out’ kind of meal. You know those nights when you don’t know what to eat and all you have is some random veggies hanging around? 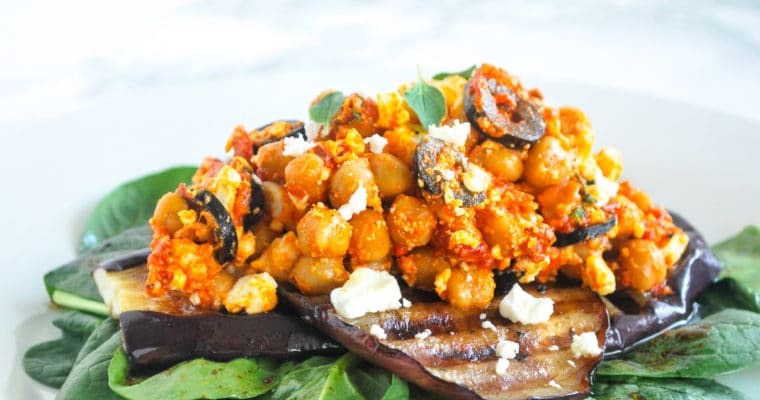 This dish is perfect for using them up! I like to think if it as an Asian style taco! 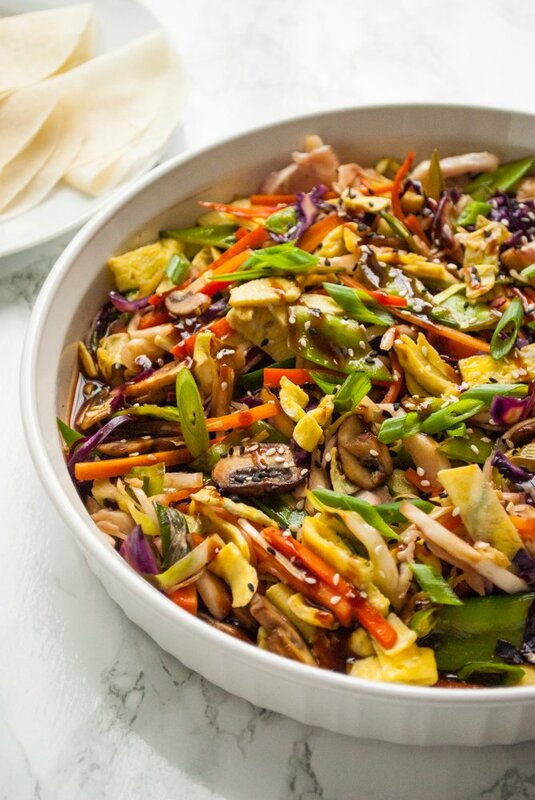 Traditionally made with pork and vegetables, moo shu is a Chinese stir fry that is served with really thin Mandarin pancakes to eat it with in North American Chinese restaurants. 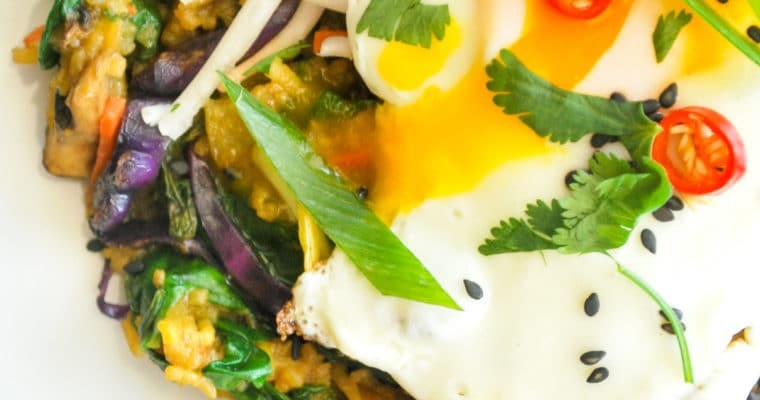 I like to make this as a vegetarian dish so I make it with just vegetables and egg. Gather all your ingredients and prepare your vegetables. 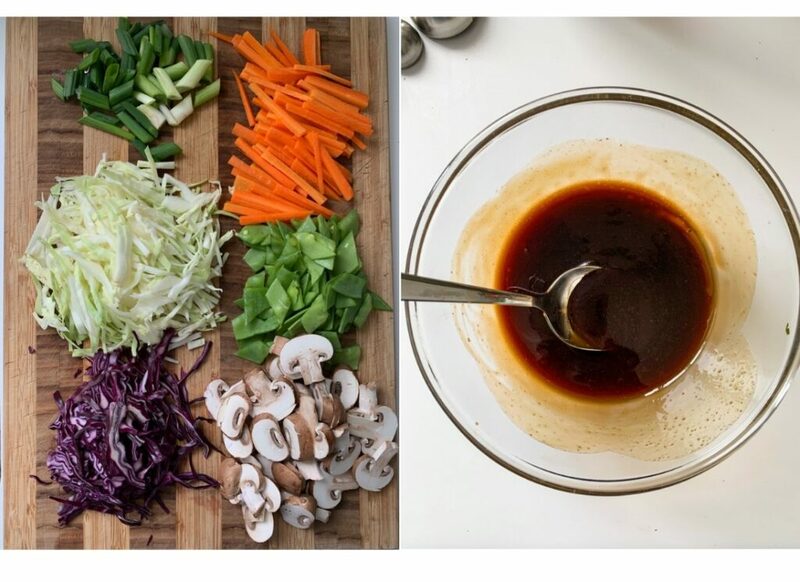 In a small bowl, mix together the hoisin sauce, rice vinegar, oyster sauce and sesame oil to make the sauce. Heat a large wok to medium high heat and add a couple of tablespoons of cooking oil to it. 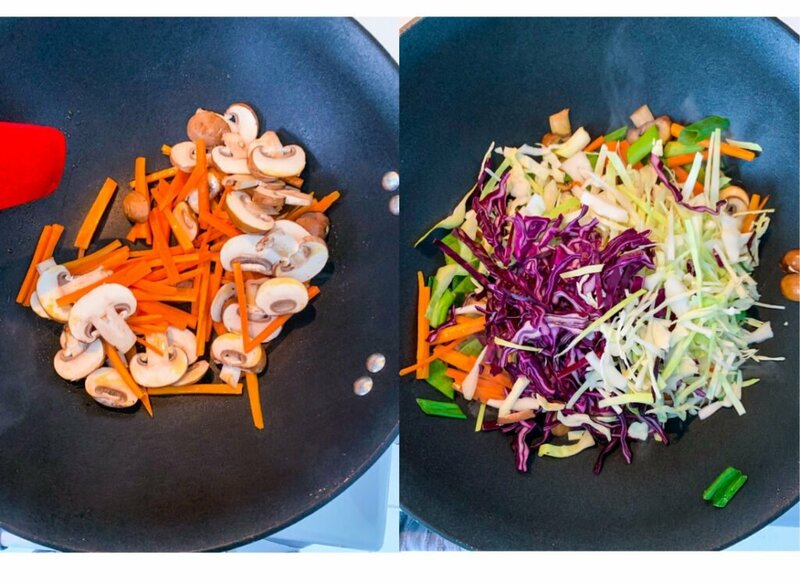 When the wok is hot, add the carrots and the mushrooms to the wok and stir fry for 2-3 minutes before adding the rest of the vegetables as they take the longest to cook. Stirfry all the veggies together for 3 – 4 minutes. You want the veggies to be heated through and to have brightened in colour, but you don’t want to overcook them. When the veggies have been stir-fried to perfection, and the sauce to the wok and toss to coat and heat through. To cook the eggs, heat a large non-stick frying pan to medium heat. When the pan is hot, add a touch of oil to the pan and spread it around. Add the beaten egg to the pan and cover with a lid. Allow the eggs to cook until they are almost set, then remove the lid, and flip the egg (it should be like a pancake) and cook for another 30 seconds. When the eggs have finished cooking, remove them to cutting board. Cut the egg into bite sized strips and add to the stirfried vegetables when they have finished cooking. Heat a large nonstick frying pan to medium heat and add a splash of cooking oil. Add the beaten eggs to the pan and cover with a lid. 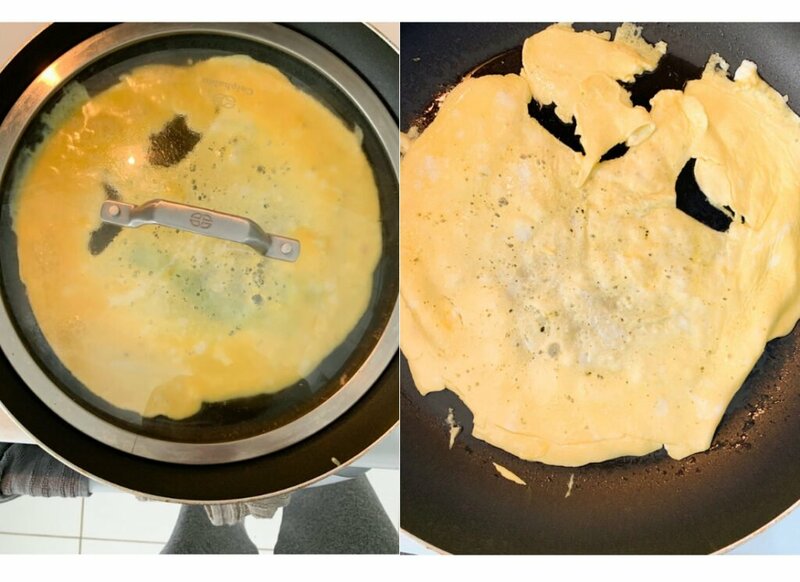 Allow the eggs to almost fully set before flipping the omelet and cooking the other side for another 30 seconds, or just until the eggs have fully set. Remove the eggs from the pan and slice into strips, reserving for later. In a small bowl, mix together the hoisin sauce, rice vinegar, oyster sauce and sesame oil. Heat a large wok to medium high heat and add a couple of tablespoons of cooking oil for stir frying. 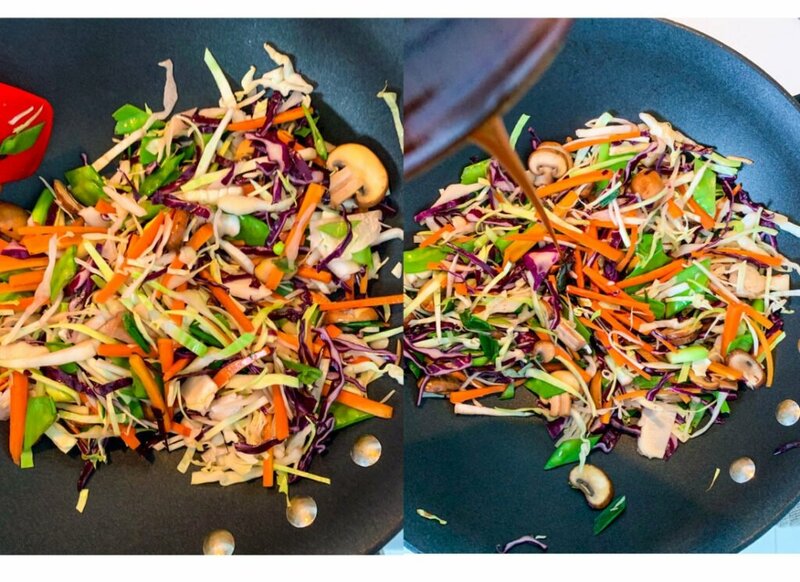 When the pan is hot, add the mushrooms and carrots and stirfry for 2-3 minutes before adding the shredded cabbage, green onion and snow peas to the wok. Continue to stir fry for another 2-3 minutes or until the veggies have brightened and softened but have not been over cooked. Add the sauce mixture to the stir and toss to coat with the wok on the burner to heat the sauce up. Remove the wok from the heat, add the egg strips to the stir fry mixture and toss to combine. This looks like a dish my entire family would love. I make stir fry a lot and love trying new recipes to keep it interesting! This looks so amazing! 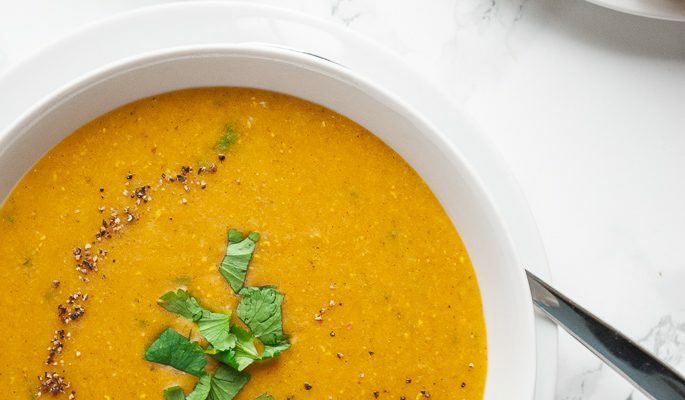 And I just love having recipes that use up all those leftovers of veggies! Where do you find your mandarin pancakes? They are handy recipes to have aren’t they? I find them at my local Asian food market, but you might find them in other specialty stores. 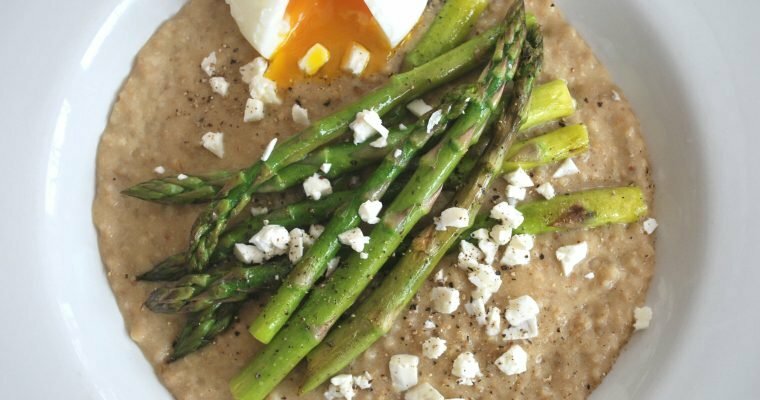 This is a perfect weeknight recipe! I love ‘clean out your fridge’ meals for the end of my week when my veggies have been eaten through and only the odds and ends remain. Thank you for this recipe! I can’t wait to try it. Thanks so much! I hope you enjoy it as much as we do!